This story by Dave Himelfield originally appeared in the Huddersfield Examiner. A controversial plan to cut library services in Kirklees has been delayed after a scrutiny panel referred it back to councillors. Kirklees Council cabinet members plan to shrink the council’s libraries’ budget from £5.7m to £3.9m. But the proposal, which would see the closure of two libraries and the end of funding for 14 of the remaining 24, was called before a scrutiny panel. Now the Labour cabinet has hit another snag after the panel referred the plan, which could lead to 100 redundancies, back to members. The panel said the cabinet’s proposal failed to supply financial information or evidence as to why certain libraries would be reducing their hours more than others. The cabinet was also asked to clarify its categorisation of libraries. Libraries had been split between ‘community supported libraries’ and ‘town libraries’, affecting what support they would be given by the council. Clr Andrew Pinnock, one of eight Lib Dems who called the plan in, said the panel had made a fair decision. But Kirklees cabinet member for resources Graham Turner defended his cabinet’s decision. Clr Turner said closing two libraries was a ‘real achievement’ considering the Government had slashed his council’s budget. “I don’t want to close libraries,” he said. “I would love to enhance our libraries. The Labour member for Denby Dale added: “Closing two libraries – that’s sad. But I would challenge you to find someone who has done so much for so little. It is hoped that libraries, which will remain open but cease to receive council cash, will be run by volunteer groups. 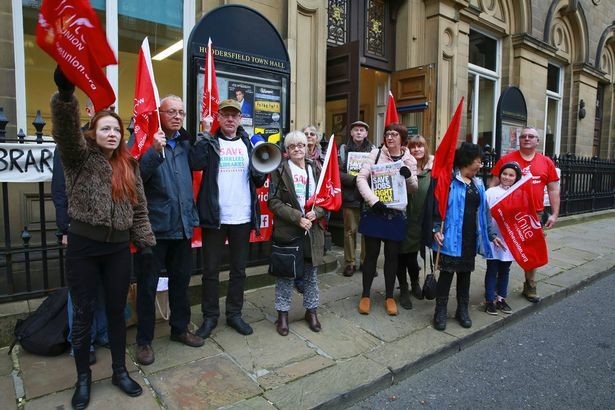 Unite and other unions protest outside Huddersfield Town Hall over the planned library cuts. 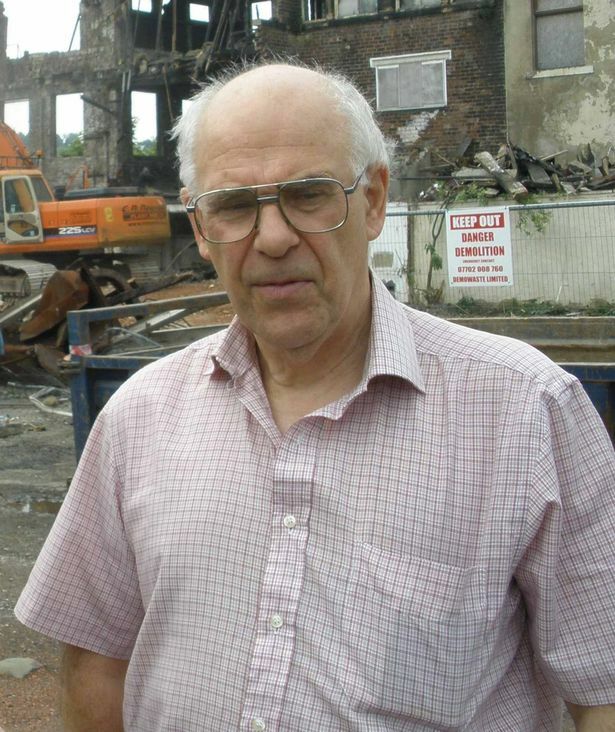 But ‘keen library goer’ Martin Jones warned the panel of the dangers of leaving community assets to their communities. One protestor at the meeting accused Kirklees cabinet of failing to consider relevant factors while another accused it of making unnecessary, ideological cuts. But members of newly-formed library volunteer groups were positive about the future of community-run libraries. Jenny Tomlinson Walsh, from Friends of Mirfield Library, said: “We’ve made good progress and have good expectations for the future of Mirfield Library. 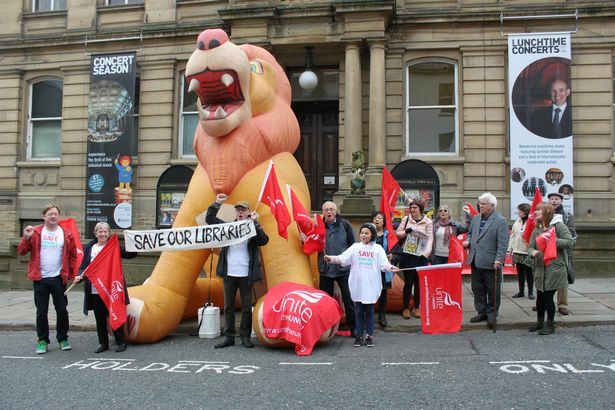 Campaigners against the cuts used a giant inflatable lion in a demonstration outside the town hall. The protest was organised by Huddersfield, Halifax and Bradford branch of union Unite Community. Inside the council chamber protesters handed in a 2,100-signature petition opposing library closures. The Labour-controlled council says government cuts are forcing it to make “hard decisions” and that councillors are working to keep open as many libraries as possible.